Hong Kong remains bullish on broadband. 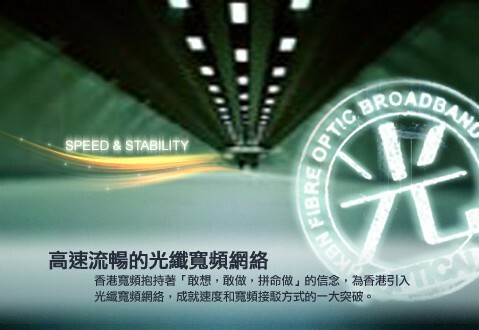 Despite the economic downturn, City Telecom continues to invest millions in constructing one of Hong Kong’s largest fiber optic broadband networks, providing fiber to the home connections to residents. City Telecom’s HK Broadband service relies on an all-fiber optic network, and has been dubbed “the Verizon FiOS of Hong Kong” for its dramatically faster broadband speeds. Hongkongers have had several choices for broadband service over the years, most offering traditional DSL service throughout the Hong Kong Special Administrative Region (Hong Kong is a territory of the People’s Republic of China). Priced around $32 a month, the most popular service choice offers residents 6Mbps downstream speeds and 0.6Mbps upstream. Some modern residential multi-dwelling units have a more advanced from of DSL service offering up to 18Mbps downstream and 1Mbps upstream. HK Broadband represents a major competitive threat for traditional DSL service in Hong Kong, because the fiber optic network provides customers with faster speeds ranging from 25Mbps-1000Mbps. The company also offers a bundle including broadband, a Voice Over IP telephone service, and IPTV (cable television) service with 80+ channels. HK Broadband offers symmetrical speeds on their network, which means your upload speed is as fast as your download speed. The company has pummeled its telephone network-reliant competitors with humorous ads that call out DSL’s slower speeds, particularly for uploads. HK Broadband “Ants” Advertisement: Ten Kung-Fu-Fighting-Ants, representing the downstream speed of a traditional DSL broadband connection, are shown ganging up on a single helpless ant, who represents the weaker upstream speed, demonstrating how traditional DSL services typically offer upload bandwidth that is only a 10th of the download speed. HK Broadband offers 100Mbps service for $35 per month, just a few dollars more than DSL. But there is an interesting catch. HK Broadband, like other providers in Hong Kong, cope with inadequate international broadband connections. Instead of engaging in Internet Overcharging schemes like usage caps, such as those found in Australia and New Zealand, the company has instead capped the speed for websites located abroad at 20Mbps for both uploads and downloads. The 100Mbps speed is reserved for domestic websites. Some subscribers note they couldn’t get speeds much faster than that when accessing overseas sites regardless of the cap, so it has not presented a major problem. As connectivity improves, so should the speeds, according to company officials. The company also has a unique residential service guarantee — they promise that you will receive at least 80% of the speed you subscribe to, or they refund double your money back. Of course, this applies only to connections made to websites within Hong Kong. When you’ve got it, flaunt it, and HK Broadband’s fiber speeds are the hallmark of their marketing campaigns. HK Broadband “Fat Pipe” Advertisement: Real life characters representing Internet content force themselves into a tiny pipeline, representing DSL, but are later liberated by a wide open fiber optic pipeline they can run through with room to spare. The investment by City Telecom in their fiber optic broadband network has brought impressive financial results to the company, with customers taking more of their telecommunications business in HK Broadband. That increases the average revenue per subscriber. The company has also aggressively increased the level of investment to build out its network, producing an economy of scale that has reduced the costs to wire new subscribers. Traditional Wall Street investors have often been unimpressed with expensive technology upgrades undertaken by telecommunications companies. Notably, Verizon Wireless’ FiOS fiber to the home network was pummeled by several investor groups who complained Verizon was spending too much on their fiber network, even though their costs to wire each new customer has dramatically decreased with time. City Telecom has turned that criticism on its head. Among many of its competitors, City Telecom is the second most profitable, earning an 11% profit margin. China Securities has showcased the company, noting it enjoys subscriber growth at levels greater than industry growth, is positioned with technology that assures it of long term stability in revenue and income growth, and despite all of the investments the company has made, retains a strong free cash flow. Most of all, it has very happy subscribers who enjoy a well regarded broadband service, available at fast speeds and a reasonable price. The incumbent telephone company’s network of copper wire, supporting lower speed DSL service, is not in the same position. HK Broadband brought Alexander Graham Bell back to life to chastise the notion that a network more than 100 years old is appropriate for 21st century broadband. HK Broadband “Alexander Graham Bell” Advertisement: The inventor of the telephone makes a “special-guest” appearance pointing out the fact that the 100 year old telephone network wasn’t designed for today’s broadband connections. This is set in a traditional Chinese Hell-like environment to imply the hellish experience of surfing the Internet with a slow connection. p style=”text-align: left;”>HK Broadband has not escaped the attention of its competitors, of course. PCCW Limited, Hong Kong’s dominant telephone company, has been aggressively marketing its own fiber, DSL, and wireless broadband products, not allowing HK Broadband to win without a fight. PCCW has had to play catch-up with HK Broadband’s aggressive fiber deployment, which focused on residential and business customers from the outset. PCCW’s fiber network was primarily intended for business customers, and now the company has been rapidly expanding their fiber network to residential customers. Today, where PCCW fiber is available, customers can choose from 18Mbps, 30Mbps, 100Mbps, or 1000Mbps service plans. Many PCCW customers will also be aggressively marketed a wireless mobile Netvigator add-on, one of PCCW’s more successful product lines. A detailed presentation of HK Broadband and its potential attractiveness to investors was produced by China Securities and features an interview with NiQ Lai, the Chief Financial Officer of City Telecom. I’d venture to say that Paxio is actually a better example of what can be done with fiber than City Telecom. Not because City isn’t a good company, but because City is based on a market reality that isn’t going to be realized in the US…ever. Paxio OTOH offers 20 Mbps symmetric service in the US for under $50, 100 Mbps for under $100 and a gigabit for under $250. These speeds are symmetric, aren’t geographically capped and are available in the US from a for-profit business. Or take LUSFiber. Granted, you’re talking about a utility service rather than a for-profit business, but when it comes down to it LUSFiber is the thing to beat today in terms of internet bang for the buck. 50 Mbps symmetric is available for $58 per month, and that’s to the internet. Local network connectivity is 100 Mbps no matter what tier you get (the 30 Mbps $45 tier, for example). And yet, here I sit this Monday morning wondering why my $20 can only buy me a 1Mbps/384kbps DSL connection, and my $35 can buy me another DSL connection which runs at 3Mbps/384kbps when Japan and China are already running 100Mbps lines via fiber which I would have already had here given what I pay for Internet. But here is an example of smart network management as well. The provider is giving you an uncapped connection (or at least a connection with an extremely high cap), providing full speed to local servers, and then rate capping connections to 20Mbps temporarilly due to the lack of transport capacity which of course will be increasing as the networks expand. That is the cheapest and most generous way of getting an Internet connection as 20Mbps is still a lot of bandwidth for one to use, not to mention a lot of sites still cap download bandwidth at 4-5Mbps. Heck at the moment 20Mbps/20Mbps service for $35 is a pipe dream for me, more or less 100Mbps/100Mbps service. Now, if a provider starts to do this in my area, they had better get local peering set up as the current ISPs in my area unless you’re paying an arm and a leg for the bandwidth all send your data out to other networks 350 miles away to get to servers in my area.